Gay.com is running an editorial today suggesting that gay Americans should vote Republican in an effort to co-opt the Grand Old Party and change their shady, earth-hating ways. It’s making gay blog headlines. We’re of two minds about this. On one hand, we agree that it does us no good to put all of our eggs in one basket. If our political system is built upon two parties; one of relatively sane but slowly moving progressivism, the other of maniacal, Bible-thumping, regressivism – it stands to reason that when the pendulum shifts to Republican power, we’re more or less screwed until the Dems are back in power. That’s no way to run an equality-minded strategy. On the other hand, Unicorn Booty reader Chi Chi Rodriguez writes, “Why would they want to? That’s like Jews trying to revive the 4th Reich. Like African Americans helping the Klan rebuild. Like Ewoks building a new Death Star. The only thing more self defeating than Gay Republicans would be gays raising money for the Mormons. Being fiscally conservative doesn’t justify being socially destructive.” Amen. What do you think? 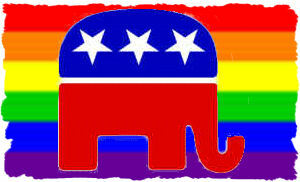 Should gays vote Republican?